Recorded live on January 22, 2006 at the Mondavi Center for the Arts, UC-Davis during Empyrean Ensembles Culture Shock! In an era of digital smoke and mirrors that makes musical superheroes out of average talent at the click of a mouse, it is refreshing to hear Noah Getz playing music I can personally attest to having heard him perform impeccably at Carnegie Hall, Stella Adler School, and Manhattan School of Music. With his first-ever release, Crosscurrents (Albany Records), Dr Getz, an Artist-in-Residence at American University, blows onto the scene with tremendous depth of feeling, robustness of tone, and technical bravado that is sure to inspire musicians and saxophonists of all interests and backgrounds. 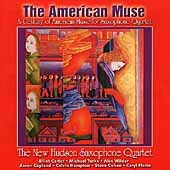 Among this set are potent presentations on tenor, alto and soprano saxophones, with adroit and sensitive collaborations from pianist Jeffrey Chappell, all offering “a diverse exploration of contemporary classical repertoire containing a variety of jazz elements.” To this end, one could not ask for a better ambassador on the horn than Noah Getz. With Miklós Maros comes a sudden shift to dense, rarefied and Rabescatura (Arabesque) textures. Here, elaborate shapes, colors, and textures, bold in their geometric proportions, leap from the musical canvass. The extremes of range and technical demands to engage in this piece (be it as listener or performer) are not for the faint of heart. However, an unexpectedly sinuous and understated line is cause for catching one’s breath - ah, such shimmering quarter-tones! Maros fulfills these newly discovered hopes by developing much further (and executed flawlessly by Getz) these naturally beautiful ear- and mind-bending effects. Upon hearing repeated technical displays from a fellow saxophonist, Lester Young is quoted as saying, “Yeah, man…but can you sing me a song?” Here, the answer is Fernando Benadon’s Song 72. Lyrical lines abound in this instrumental dialogue between Getz and Chappell, where ideas borrowed from the entire 20th-century of jazz (including stride and new-age piano, coupled with cool and bebop saxophone) diverge and coalesce with a capricious give and take, neither voice dominating the texture for too long, and, at times sounding only distantly related. I might have liked slightly more warmth of vibrato for sweetening the gestures, which linger oh, so briefly at times. But, isn’t that the sign of good singers and songwriters - leaving the listener wanting more? Scott Lindroth’s Chasing the Trane Out of Darmstadt is an intensely engaging reminder that avant garde classical and jazz share the same sonic fringe. Here, direct solo quotations from Coltrane’s live recording are combined with serialism for an effect that sounds both free and structured at the same time. Trane’s experiments with alternate fingerings, multiphonics, growling and other tone quality devices give the entire composition a feeling of Cecil Taylor’s “energy music” which ebbs and flows in intensity, while building to a climax where actual improvisation flows seamlessly into the recapitulation. The musical subject matter, deft instrumental interplay, and varied textures easily held my interest. A welcome musical offering on soprano saxophone is Partita, a sparkling gem written by Ronald Roseman. In the opening “Allegro furioso”, a swirling spiral of notes contains a string of ideas, one after the other, containing the source material for subsequent movements. There is an improvisatory character, like that of a fantasia, which takes the listener through a wide range of possibilities, my favorite being the brooding low-note tremolos. “Blues” combines the elements of compound melody with music that is happy about being sad. Here, Getz “walks” the bass line while making slightly snide remarks with the melody. Taking on introspective characteristics of a soliloquy, “Aria” searches for just the right sentiment of expression. “Forlane” is playful, full of sprightly staccato and vigor, and a perfect balance to round out this substantive work. The highly engaging closer, Sonata deus sax machina, provides plenty of food for thought on our mechanized society and the musical source material contained within. Gregory Wanamaker’s surname and musical characteristics hearken to an earlier time in American history, capturing both the feelings of optimism and alienation spawned by the industrial age. The first movement (quarter note = 132), begins in happy-go-lucky fashion, quickly spinning nearly (but not quite) out of control, with flashes of frenetic angst represented by wild leaps, pitch bending, slap-tongue and multiphonics. The second movement (quarter note = 48) borrows a page from Morton Feldman for an ideal effect of haunting solitude reflected by a softly humming electronic device. Here, a stark pianistic backdrop offsets the occasional multiphonic rattle. The cartoonish finale (eighth note = 132) flutters and pounds away in regular asymmetric meters while brief reminders of earlier themes provide pause for reflection; but then it’s back to pounding! With Crosscurrents, Noah Getz and Jeffrey Chappell offer a saxophone and piano recital of the highest quality. The musical selections, interpretations, audio fidelity, artwork and liner-notes are supremely first-rate. It pleases me to recommend this recording without reservation.